WEST HAVEN, Conn.--(BUSINESS WIRE)-- NanoViricides, Inc. (OTC BB: NNVC.OB) (the "Company") reported today that its FluCide™ drug candidates demonstrated dramatically improved survival in animals administered a lethal dose of influenza virus. Animals treated with all of the different influenza nanoviricide drug candidates survived for dramatically longer periods as compared to Tamiflu® treated animals. A typical nanoviricides drug is designed like a chemical "missile." It has a number of recognition "ligands" on its surface, that are specific to a single type of virus, say HIV. They are like the "GPS on a guided missile." The ligands are designed to identify the viral intruder and attach to specific "landing sites" on the surface of the virus particle. The nanoviricides drug, after landing, spreads itself all over the virus particle, and thus completely neutralizes and disables the virus particle from binding to its target, a human cell. This is the magic of the flexible TheraCour nanomaterials. Hard sphere nanomaterials such as dendritic materials, nanogold shells, silica, gold or titanium nanospheres, polymeric particles, etc., cannot do this. Completely neutralizing and disabling the virus particle is more than the best of today's drugs do. FluCide-I, our first generation drug, is designed to do just that. Our second generation drugs will do even more. These will be designed like "Trojan horses." After landing on the virus particle, as the nanoviricide spreads itself onto the virus surface, it will inject a chemical that will seek the viral genome and chop it into pieces. TheraCour technology has the encapsulation ability that enables such Trojan Horse attacks. The NanoViricides approach is capable of attacking many other viruses as well. What is a nanoviricide ? A "nanoviricide™" is a flexible nano-scale material approximately a few billionths of a meter in size, which is chemically programmed to specifically target and attack a particular type of virus like a guided missile. A lot of development work is required for each drug candidate from the stage of designing it to obtaining regulatory approvals (e.g. US FDA) for use as a drug in humans. 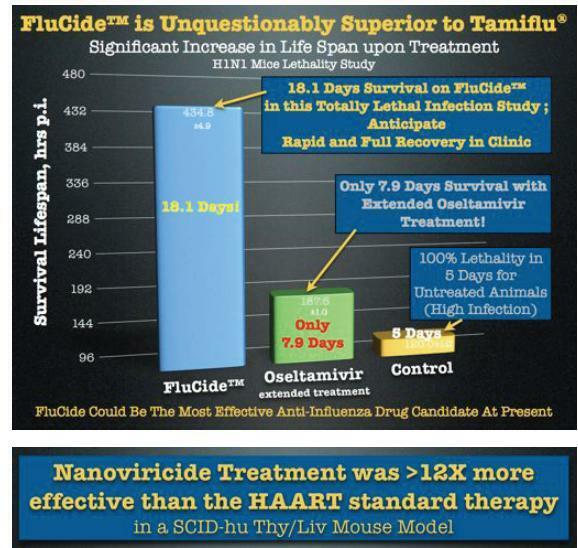 NanoViricides, Inc. (OTC BB: NNVC.OB) (the "Company") reported dramatically improved antiviral efficacy with its optimized FluCide(TM) drug candidates in its most recent animal study. In the influenza mouse lethal infection model, animals treated with one of the optimized FluCide(TM) nanoviricide drug candidates survived beyond the stated full duration of study (21 days), and those treated with two additional drug candidates survived almost the full duration of the study. Animals in these three groups survived significantly longer (20.2 to 22.2 days) as compared to the animals treated with Oseltamivir (Tamiflu(R); only 8.3 days). The studies were conducted by Dr. Krishna Menon, PhD, VMD, MRCS, at KARD Scientific, MA. One million virus particles of Influenza A Strain A/WS/33 (H1N1) were aspirated directly into the lungs of mice. The same quantity of virus infection was repeated at 22 hrs. This influenza model was designed to be uniformly fatal in 100% of the infected, untreated animals within 5 days after infection. Treatment with the FluCide candidates and Tamiflu(R) (Roche) commenced 24 hours after the first viral infection. The duration of study was set at 21 days in the protocol. It was extended in order to properly evaluate the longest surviving animals. The Company had previously reported 18.3 days mean survival with its then best anti-influenza drug candidate in the same animal model. Since then the Company says its FluCide program has progressed to process chemistry optimizations that were expected to provide additional benefits in terms of efficacy and safety improvements. The Company now reports that these improvements have led to animal survival over the full defined 21 day duration of study for one drug candidate, with two additional drug candidates close behind the top candidate, at 20.2 and 20.4 days. "We believe that we may have more than quadrupled the efficacy of our FluCide candidates since the last study, based on the survival data," said Anil R. Diwan, PhD, President, adding, "We believe that current anti-influenza drugs would not match the efficacy levels achieved by our FluCide drug candidates, even at high dosages due to the former's dose-limiting toxicities." Additional clinically important parameters including viral load and lung histopathology, are being analyzed to confirm the therapeutic potential of the FluCide drug candidates. The results of these investigations will be reported as they become available. "We eagerly await the viral load and histopathology results to guide our next steps in this program," said Randall Barton, PhD, Chief Scientific Officer of the Company. " This news gave only 5% pps spike. Sure that most of investors did not understand what are these results. I will say one word: miracle. This influenza model was designed to be uniformly fatal in 100% of the infected, untreated animals within 5 days after infection i.e. all mice died during these 5 days. I saw several times how mice are dying when one million virus particles (different influenza strain) were aspirated directly into their lungs. Believe me it's very gloomy picture. Dying mice lie together side by side trying to warm each other (may because mouse body temperature decreases when they ill). Usually nobody survive in day 5. Even some immunized animals are dying in this experimental model. Each year, the influenza virus is responsible for an estimated 36,000 deaths and up to 150,000 hospitalizations in the United States making it a significant public health problem. "Treatment with the FluCide candidates and Tamiflu(R) (Roche) commenced 24 hours after the first viral infection" i.e. mice already had influenza symptoms. "animals treated with one of the optimized FluCide(TM) nanoviricide drug candidates survived beyond the stated full duration of study (21 days), and those treated with two additional drug candidates survived almost the full duration of the study. Animals in these three groups survived significantly longer (20.2 to 22.2 days) as compared to the animals treated with Oseltamivir (Tamiflu(R); only 8.3 days). In simple words FluCide cured fatally ill mice! That was the reason why I used the word "miracle". At the present time no one drug can do it. Disclosure: I don't have NNVC positions now. "NanoViricides, Inc. (OTCBB: NNVC) (the "Company") reports that its lead anti-HIV drug candidate achieved a long term anti-HIV effect with a much shorter dosing regimen and a markedly lower total drug dose than HAART drug cocktail therapy in a recent animal study. The antiviral effect of the anti-HIV nanoviricide (“HIVCide™”) continued throughout the 48 days of study even though HIVCide dosing was discontinued after only 20 days. The clinical benefit of HIVCide was found to be sustained for at least four weeks after the last drug dose. Treatment with the lead anti-HIV nanoviricide both (1) reduced the HIV viral load and (2) also protected the human T cells (CD4+,CD8+), equally well as compared to treatment with the three-drug HAART cocktail, at 24-days as well as at 48-days, even though the HIVCide treatment was stopped at 20 days. The Company believes that achieving this sustained clinical benefit after stopping nanoviricide treatment is highly significant. A similar sustained reduction in viral load even after discontinuation of the drug was also observed for the Company’s previously reported anti-influenza FluCide™ lead drug candidate. Such sustained, prolonged clinical effects can be expected on the basis of the design of nanoviricides. A nanoviricide is made from a polymeric micelle structure that is designed to provide long circulating half-life in the body that should enable sustained therapeutic effectiveness. In addition, the lead HIVCide drug candidate provided these clinical benefits at a much lower drug load than that of the HAART therapy. The HIVCide total dose was 1,200 mg/kg while the HAART cocktail dose was 4,800 mg/kg. The HIVCide candidate was dosed only 8 times in the first 20 days after HIV infection. HIVCide treatment was stopped after 20 days. In contrast, in the comparator group, HAART cocktail treatment continued for the entire 48 days. The HIV viral load was markedly reduced to the same extent in both the HIVCide-treated mice and the HAART-treated mice throughout the 48 days study. In addition, the “double positive”, CD4+,CD8+, human T cells were protected to similar extents in the HIVCide and HAART treatment groups, throughout the duration of the study. There were no side effects or adverse effects observed for the HIVCide therapy group." No comments for this data from wise biotech analysts? We just have a possible cure for HIV, HCV, Ebola, influenza and many other enveloped viruses. Just small "silver nanobullet" for all of them. NNVC cap is still less than $200. And no one big pharma is not swallowed this microcap? Disclosure: I have NNVC positions. "In the USA alone, there are approximately 300,000 severe influenza cases that require hospitalization every year resulting in approximately 40,000 deaths. Expert physician advice suggests that the dosage form should be a high strength solution suitable for “piggy-back” incorporation into the standard IV fluid supplement system that is commonly used in hospitalized patients. Since current influenza treatments have limited effectiveness in these patients because of the severity of the infection, there is a significant unmet medical need for the treatment of hospitalized influenza patients, which include immunocompromised patients. NV-INF-1 promises to be a highly effective anti-influenza drug, based on the extremely high efficacy observed in animal studies, and the Company believes that it would receive rapid and widespread acceptance for the treatment of hospitalized patients with severe influenza." "The NNVC novel nanoviricide® class of drug candidates are designed to specifically attack enveloped virus particles and to dismantle them. The Company is developing drugs against a number of viral diseases including H1N1 swine flu, H5N1 bird flu, seasonal Influenza, HIV, oral and genital Herpes, viral diseases of the eye including EKC and herpes keratitis, Hepatitis C, Rabies, Dengue fever, and Ebola virus, among others." Hepatitis C? Look at VRUS that invented a "new drug" that will only slow down HCV. VRUS so-called "nucs" will never cure HCV, they will only postpone this. But NNVC drugs can cure HCV and many other viruses like HIV, Herpes... But VRUS cap is $5B and NNVC cap is $150M... Why it's so big difference (>30 times)? May be the answer is very simple: patients will take VRUS "drugs" during entire life and pay giant money (drug will be very expensive) but NNVC drug is cheap and may be will cure the entire HCV infected population during short period of time. Everybody knows that there is no cure for viruses, only preventive vaccination may stop them. Well it was no cure... Now we have NNVC drug and one new potential drug DRACO that could cure almost any viral infection. Will "big pharmas" are interesting to license these new drugs that "in theory, should work against all viruses"? I'm not sure. What if these new drugs really kill all dangerous viruses? Who will pay for vaccines and $49,200 for 12-week course of treatment? 7:00a ET December 5, 2011 (Business Wire) NanoViricides, Inc. (OTC BB: NNVC) (the "Company") announced today that it has submitted a pre-IND Meeting Request to the US FDA. The Company has requested an initial meeting with the US FDA to review the Company's proposed strategy and plan for conducting safety/toxicology studies and human clinical trials required for approval of its anti-influenza clinical drug candidate, FluCide(TM) (i.e. NV-INF-1). "This submission is a major milestone in the Company's program to obtain US FDA approval for FluCide(TM)," said Eugene Seymour, MD, MPH, CEO, adding, "FluCide has demonstrated excellent efficacy and safety when treating influenza infections in our animal studies. We anticipate similar strong results in humans when the drug becomes available for human use." The Company has submitted required introductory documentation with the meeting request letter in consultation with the Company's regulatory matters consultants, viz. the Biologics Consulting Group. The Company plans to submit additional briefing documents at least thirty days before the FDA meeting, in compliance with the FDA guidelines. This pre-IND meeting request submission follows the Company's recent announcement that it has chosen a clinical candidate, NV-INF-1, in its anti-influenza drug program (FluCide(TM)) to develop for regulatory submissions both domestically and internationally. It is estimated that there are about 50 million cases of influenza annually in the USA alone, and about 250,000 patients are hospitalized for influenza. The Company believes that a single course of therapy that can be easily administered by a medical office is likely to be feasible for out-patients, with no additional follow-on treatment necessary. This expectation is based on the following results from its animal studies: (1) the extremely high treatment effectiveness in inhibiting the cycle of infection, virus expansion and spread of infection and, (2) the significantly long lasting effects of the drug treatment after the drug is discontinued. In addition to out-patients, the Company also plans to develop an indication for hospitalized severe cases of influenza. The Company has recently announced that it is working on developing cGMP ("current Good Manufacturing Practices") manufacturing capability for the production of its drug candidates. cGMP manufactured materials will be required when the Company is ready to file an Investigational New Drug (IND) application to the US FDA." "The flu appears to kill about one of every 2,000 people who get it, American researchers say. (British researchers found half that death rate.) By contrast, the Spanish flu of 1918 killed about 50 of every 2,000, and the 1957 and 1968 pandemics killed about 4 of every 2,000." When a second wave of the virus returned to North America in the fall, avaccine had been prepared, although it was initially in short supply. By mid-November, federal officials were putting the death toll at about 10,000, far below the 30,000 to 90,000 range a presidential panel had predicted." How many people die from seasonal flu each year in the United States? The number of seasonal influenza-associated (i.e., seasonal flu-related) deaths varies from year to year because flu seasons are unpredictable and often fluctuate in length and severity. Therefore, a single estimate cannot be used to summarize influenza-associated deaths. Instead, a range of estimated deaths is a better way to represent the variability and unpredictability of flu. An August 27, 2010 MMWR report entitled “Thompson MG et al. Updated Estimates of Mortality Associated with Seasonal Influenza through the 2006-2007 Influenza Season. MMWR 2010; 59(33): 1057-1062.," provides updated estimates of the range of flu-associated deaths that occurred in the United States during the three decades prior to 2007. CDC estimates that from the 1976-1977 season to the 2006-2007 flu season, flu-associated deaths ranged from a low of about 3,000 to a high of about 49,000 people. Death certificate data and weekly influenza virus surveillance information was used to estimate how many flu-related deaths occurred among people whose underlying cause of death was listed as respiratory or circulatory disease on their death certificate. How do the new estimates compare with the 36,000 figure that is often cited as an estimate of annual flu-associated deaths? The 36,000 estimate was presented in a 2003 study by CDC scientists published in the Journal of the American Medical Association (JAMA), using similar statistical modeling techniques, but only refers to a period from 1990-91 through 1998-99. During those years, the number of estimated deaths ranged from 17,000 to 52,000, with an average of about 36,000. The JAMA study also looked at seasonal influenza-associated deaths over a 23 year period, from 1976-1977 and 1998-1999. During that period, estimates of respiratory and circulatory influenza-associated deaths ranged from about 5,000 to about 52,000, with an average of about 25,000. While the 36,000 number is often cited, it's important to note that during that decade, influenza A (H3N2) was the predominant virus during most of the seasons, and H3N2 influenza viruses are typically associated with higher death rates. CDC believes that the range of deaths over the past 31 years (~3,000 to ~49,000) is a more accurate representation of the unpredictability and variability of flu-associated deaths. But why even these 25,000-36,000 people should be killed annually in USA by flu? May be FluCide(TM) will save them? The truth is simple and terrible about flu: we don't have a drug that really cure flu. Roche predicted in October that annual sales of Tamiflu should reach a "maximum" of one billion Swiss francs in 2010, compared to 3.2 billion in 2009. Of 80 mice infected with H5N1 virus, 20 received a placebo, 30 were given oseltamivir at one of three dosage levels for five days, and 30 received the drug at one of three dosage levels for eight days. None of the mice receiving a placebo survived. Only five of 10 mice given the highest daily dose of oseltamivir for five days survived. Although oseltamivir suppressed the virus in the mice, the virus continued to grow if the drug was stopped after five days. Mice given the drug for eight days fared better. Survivors included one of 10 mice given the lowest daily dose, six of 10 given the middle-range daily dose, and eight of 10 given the highest daily dose. The eight-day dose of oseltamivir allowed more time for virus levels to fall and less chance for avian flu to rebound after the drug was stopped. The above description of the in vivo test of oseltamivir (Tamiflu) is consistent with prior in vitro studies which strongly suggest that use of Tamiflu at the recommended dosage will produce little benefit. Many countries have stockpiled Tamiflu and more have placed orders. However, the amount of Tamiflu ordered was based on the assumption that a course of 10 pills would be effective for 10 days of prevention or 5 days of treatment. However, this assumption was not supported by in vitro data and now is also not supported by in vivo data. Tamflu targets the NA gene product neuraminidase. Influenza A codes for nine NA serotypes and Tamiflu had been previously tested against all nine, using two representative viruses for each. Although Tamiflu could inhibit spread of the virus, it was far more effective against N2 (as in human H3N2) than N1 (as in human H1N1 or avian H5N1). All of the human H5N1 isolates since 2004 have had a 20 amino acid deletion in N. Recent studies using the more recent isolates which have the deletion again showed that Tamiflu worked, but was even less effective than N1 without the deletion. The resposnse was dose dependent and suggests improvement may be obtained if a higher dose is used or if treatment is for a longer period of time, but the FDA approved treatment regime would probably not be effective. These marginal results under ideal experimental conditions do not suggest Tamiflu would be effective under pandemic conditions if used at the recommended dose for the recommended time. Indeed, Tamiflu was used on tigers exposed to H5N1 at the Sri Rahka zoo in Thailand last year. Control of the outbreak with culling and aggressive Tamiflu use failed to save many, if any, of the exposed tigers, which may have been limited to the 147 that died or were euthanized. The H5N1 isolate, A/Vietnam/1203/2004, used in the mouse experiments is a more aggressive version of the 2004 isolates and it is neurotropic, causing hind leg paralysis in infect ferrets. It has the G1906A polymorphism that produces the E627K change in the PB2 protein, which was also found in most of the tiger isolates as well as all isolates from Qinghai Lake. Thus, it might be useful to determine the effects of Tamiflu treatment on the ability of the H5N1 to reach the brain of infected mice if they survive the bird flu infections. Clearly more work is required to determine the effective dose of Tamiflu. The boxun reports indicate that there are at least 10 distinct strains of H5N1 in China, and 8 can infect humans. Therefore information the effect of Tamiflu on a range of H5N1 variants might be useful. However, at this time it seems that usefulness of Tamiflu at FDA recommended doses remains questionable for control of an H5N1 flu pandemic. So, question is: Why FDA keeps silence? Do FDA knows that in 2012 25,000-36,000 people will die again because of flu? These people have nothing to lose only their lifes and they will agree to be patients in NNVC human clinical trials. And what will happen if "An Engineered Doomsday" Flu virus free? "Scientists have long worried that an influenza virus that has ravaged poultry and wild birds in Asia might evolve to pose a threat to humans. Now scientists financed by the National Institutes of Health have shown in a laboratory how that could happen. In the process they created a virus that could kill tens or hundreds of millions of people if it escaped confinement or was stolen by terrorists. "The most frightening research was done by scientists at the Erasmus Medical Center in Rotterdam, who sought to discover how likely it is that the “bird flu” virus, designated A(H5N1), might mutate from a form that seldom infects or spreads among humans into a form highly transmissible by coughing or sneezing. Thus far the virus has infected close to 600 humans and killed more than half of them, a fatality rate that far exceeds the 2 percent rate in the 1918 influenza pandemic that killed as many as 100 million people. Working with ferrets, the animal that is most like humans in responding to influenza, the researchers found that a mere five genetic mutations allowed the virus to spread through the air from one ferret to another while maintaining its lethality. A separate study at the University of Wisconsin, about which little is known publicly, produced a virus that is thought to be less virulent." So all "amazing results" with nanoviricides are under question now. Conclusions: I changed NNVC to sell.